Javelina (Tayassu tajacu) also known as collared peccary, are medium-sized animals that look similar to a wild boar. They have mainly short coarse salt and pepper colored hair, short legs, and a pig-like nose. The hair around the neck/shoulder area is lighter in color giving it the look of a collar. Javelina have long, sharp canine teeth which protrude from the jaws about an inch. 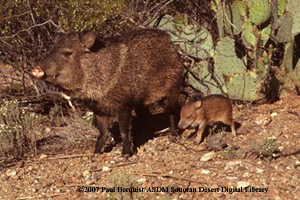 One major adaptation for survival is the fact that javelina live in large family groups. The average group size is 10 or less, but a few herds have known to number up to 53 animals. Each group defends a territory which includes their sleeping and feeding areas. They communicate with their own family group and other groups using sounds and smells. Javelina live in desert washes, saguaro and palo verde forests, oak woodlands, and grasslands with mixed shrubs and cacti. They can be found in the deserts of southwest Texas, New Mexico, Arizona, southward through Mexico and Central America and into northern Argentina. Javelina are doing well and are not currently listed as threatened. Javelina are classified as herbivores. They eat a variety of native plant foods such as agave, mesquite beans, and prickly pear, as well as roots, tubers, and other green vegetation. However, if the opportunity presents itself, they will also eat lizards, dead birds and rodents. The main predators of Javelina are mountain lions, humans, coyotes, bobcats and jaguars. In the heat of the day javelina will rest in the shade of a mesquite tree or under rocky outcroppings. They have been know to rest in the shade under mobile homes, causing damage to the structure as they push their way in. In the wild, javelina live to be about 10 years old although some live longer. Captive javelina have been known to live over 20 years old. Javelina stand about 2 feet tall and can weigh between 35 and 55 pounds. They are 3 to 4 feet long. Javelina have a scent gland on the top of their rump covered by long hairs. They will rub their scent on rocks and tree stumps to mark their territory, as well as rubbing the scent on each other to help with identification. Javelina are not pigs. They look similar, but pigs are from the "Old World" and peccary are "New World" animals. There are many other differences most having to do with differences in physical anatomy. Adult females can give birth at anytime of the year. The young are often called "reds" due to the red color of their hair.